Preface. Chapter 1. The Nature of the Carbonate Depositional System. The Basic Nature of Carbonate Sediments and Sedimentation. (Sample images from CD-ROM in pdf format: /inca/publications/misc/622101fig1-13.pdfFig.1-13 /inca/publications/misc/622101fig1-14.pdfFig.1-14 /inca/publications/misc/622101fig1-17.pdfFig.1-17) Introduction. Origin of carbonate sediments. The reef: a unique depositional environment. Unique biological control over the texture and fabric of carbonate sediments. Carbonate grain composition. Carbonate rock classification. Efficiency of the carbonate factory and its impact on patterns of carbonate sedimentation. Carbonate platform types and facies models. Summary. Chapter 2. Concepts of Sequence Stratigraphy as Applied to Carbonate Depositional Systems. (Sample images from CD-ROM in pdf format: /inca/publications/misc/622101fig2-3.pdfFig.2-3 /inca/publications/misc/622101fig2-6.pdfFig.2-6 /inca/publications/misc/622101fig2-13.pdfFig.2-13) Introduction. Sequence Stratigraphy. Eustasy, tectonics and sedimentation: the basic accommodation model. Hierarchy of Stratigraphic Cycles. Introduction of Carbonate Sequence Stratigraphic Models. The Ramp Sequence Stratigraphic Model. The Rimmed Shelf Sequence Stratigraphic Model. The Escarpment Margin Sequence Stratigraphic Model. Sequence Stratigraphic Model of Isolated Platforms. High-frequency cyclicity on carbonate platforms: carbonate parasequences. The Consequences of the High-Chemical Reactivity of Carbonate Sediments and Rocks During Exposure at Sequence Boundaries. Carbonate minerals and their relative stability. Controls over the mineralogy of carbonate sediments, today and in the past. Mineralogy of ancient limestones: the concept of early progressive mineral stabilization and porosity evolution. Summary. Chapter 3. 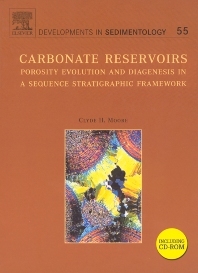 The Classification of Carbonate Porosity. (Sample images from CD-ROM in pdf format: /inca/publications/misc/622101fig3-8.pdfFig.3-8 /inca/publications/misc/622101fig3-12.pdfFig.3-12 /inca/publications/misc/622101fig3-21.pdfFig.3-21) Introduction. The Nature and Classification of Carbonate Porosity. Choquette and Pray porosity classification. The Lucia rock fabric/petrophysical carbonate porosity classification. The Nature of Primary Porosity in Modern Sediments. Intergrain porosity. Intragrain porosity. Depositional porosity of mud-bearing sediments. Framework and fenestral porosity. Secondary Porosity. Introduction. Secondary porosity formation by dissolution. Secondary porosity associated with dolomitization. Secondary porosity associated with breccias. Secondary porosity associated with fractures. Summary. Chapter 4. Diagenetic Environments of Porosity Modification and Tools for their Recognition in the Geologic Record61. (Sample images from CD-ROM in pdf format: /inca/publications/misc/622101fig4-1.pdfFig.4-1 /inca/publications/misc/622101fig4-4.pdfFig.4-4 /inca/publications/misc/622101fig4-17.pdfFig.4-17) Introduction. Marine environment. Meteoric environment. Subsurface environment. Petrography-cement morphology. Petrography-cement distribution patterns. Petrography-grain-cement relationships relative to compaction. Trace element geochemistry of calcite cements and dolomites. Stable isotopes. Strontium isotopes. Fluid Inclusions. Chapter 5. Normal Marine Diagenetic Environments. (Sample images from CD-ROM in pdf format: /inca/publications/misc/622101fig5-3.pdfFig.5-3 /inca/publications/misc/622101fig5-16.pdfFig.5-16 /inca/publications/misc/622101fig5-29.pdfFig.5-29) Introduction. Shallow Water, Normal Marine Diagenetic Environments. Abiotic shallow marine carbonate cementation. Recognition of ancient shallow marine abiotic cements. Biologically mediated marine carbonate cementation and diagenesis. Diagenetic setting in the intertidal zone. Modern shallow water submarine hardgrounds. Recognition and significance of ancient hardgrounds. Diagenetic setting in the modern reef environment. Recognition of reef-related marine diagenesis in the ancient record. Early marine lithification of the Permian Capitan reef complex New Mexico, USA. Porosity evolution of the Golden Lane of Mexico and the Stuart City of Texas. Porosity evolution of Devonian reefs: Western Canadian Sedimentary Basin. Slope To Deep Marine Diagenetic Environments. Introduction to diagenesis in the slope to deep marine environment. Carbonate diagenesis associated with ramp to slope mud mounds. Carbonate diagenesis of mounds near hydrothermal and hydrocarbon vents. Carbonate diagenesis associated with escarpment shelf margins: Enewetak Atoll. Carbonate diagenesis of steep escarpment shelf margins: Bahama Platform. Summary. Chapter 6. Evaporative Marine Diagenetic Environments. (Sample images from CD-ROM in pdf format: /inca/publications/misc/622101fig6-27.pdfFig.6-27 /inca/publications/misc/622101fig6-36.pdfFig.6-36 /inca/publications/misc/622101fig6-42.pdfFig.6-42) Introduction. Introduction to diagenesis in evaporative marine environments. The Marginal Marine Sabkha Diagenetic Environment. Modern marginal marine sabkhas. Diagenetic patterns association with ancient marginal marine sabkhas. Ordovician Red River marginal marine sabkha reservoirs, Williston Basin, USA. Mississippian Mission Canyon marine sabkha reservoirs, Williston Basin, USA. Ordovician Ellenburger marine sabkha-related dolomite reservoirs, west Texas, USA. Criteria for the recognition of ancient marginal marine sabkha dolomites. Marginal Marine Evaporative Lagoons Reflux Dolomitization. The marginal marine evaporative lagoon as a diagenetic environment. Permian Guadalupian west Texas, USA: an ancient evaporative lagoon complex. Permian reservoirs of the South Cowden Field, Texas: reflux dolomitization. Jurassic Smackover dolomitization, Texas, USA: a reflux dolomitization event. Criteria for the recognition of ancient reflux dolomites. Regional evaporite basins, coastal salinas, their setting and diagenetic environment. The MacLeod salt basin. The Elk Point Basin of Canada. Michigan Basin, USA. Jurassic Hith Evaporite and the Arab Formation, Middle East. Summary. Chapter 7. Diagenesis in the Meteoric Environment. (Sample images from CD-ROM in pdf format: /inca/publications/misc/622101fig7-8.pdfFig.7-8 /inca/publications/misc/622101fig7-33.pdfFig.7-33 /inca/publications/misc/622101fig7-36.pdfFig.7-36) Introduction. Geochemical and Mineralogical Considerations. Geochemistry of meteoric pore fluids and precipitates. Isotopic composition of meteoric waters and meteoric carbonate precipitates. Mineralogic drive of diagenesis within the meteoric environment. Implication of kinetics of the CaC03-H20-C02 system in meteoric environments. Climatic effects. Hydrologic setting of the meteoric diagenetic environment. The Vadose Diagenetic Environment. Introduction. Upper vadose soil or caliche zone. Lower vadose zone. Porosity development in the vadose diagenetic environment. The Meteoric Phreatic Diagenetic Environment. Introduction. Immature hydrologic phase: island-based and land-tied floating meteoric water lenses developed in mineralogically immature sediments. Bermuda, a case study of an island with a permanent floating fresh water lens. Meteoric diagenesis in Quintana Roo, Mexico strandplains. The Oaks Field, meteoric diagenesis in a Jurassic shoreline, Louisiana, USA. The mature hydrologic phase: regional meteoric water systems in sea level lowstands. Mature hydrologic system: regional system in a sea level lowstand: Bahama Bank. Mature hydrologic system: regional gravity-driven system developed during relative sea level lowstand on a land-tied carbonate shelf. Porosity development and predictability in regional meteoric aquifer environments. Geochemical trends characteristic of a regional meteoric aquifer system. Mississippian grainstones of a southwestern New Mexico, USA: a case history of porosity destruction in a regional meteoric aquifer system. Karst Processes, Products and Related Porosity. Introduction. Solution, cementation, and porosity evolution in a mature karst system. Yates Field, Texas, USA: case history of an unconformity-related karsted reservoir. Dolomitization Associated with Meteoric and Mixed Meteoric-Marine Waters. Introduction. Meteoric-marine mixing, or Dorag model of dolomitization. Concerns about the validity of the mixing model of dolomitization. Modern mixing zone dolomitization. Pleistocene to Miocene mixing zone dolomitization. Mississippian North Bridgeport Field, Illinois Basin, USA: mixed water dolomite reservoirs. Where do we stand on mixing zone dolomitization today? Summary. Chapter 8. Summary of Early Diagenesis and Porosity Modification of Carbonate Reservoirs in a Sequence Stratigraphic and Climatic Framework. (Sample images from CD-ROM in pdf format: /inca/publications/misc/622101fig8-1.pdfFig.8-1 /inca/publications/misc/622101fig8-11.pdfFig.8-11 /inca/publications/misc/622101fig8-14.pdfFig.8-14) Introduction. Reservoir Diagenesis and Porosity Evolution During 3rd Order Sea Level Lowstands (LST). Introduction. Diagenesis/porosity model of a carbonate ramp during sea level lowstand (LST). Diagenesis/porosity model of a steep-rimmed carbonate shelf during sea level lowstand (LST). Diagenesis/porosity model of a rimmed isolated carbonate platform during sea level lowstand (LST). Reservoir Diagenesis and Porosity Evolution During 3rd Order Sea Level Rises (TST). Introduction. Diagenesis/porosity model for a ramp in a rising sea level (TST). Diagenesis/porosity model for a rimmed shelf during a rising sea level (TST). Diagenesis/porosity model of a rimmed isolated carbonate platform during sea level rise (TST). Reservoir Diagenesis and Porosity Evolution During 3rd Order Sea Level Highstands (HST). Introduction. Diagenesis/porosity model for a ramp during a sea level highstand (HST). Diagenesis/porosity model for a rimmed shelf during a sea level highstand (HST). Diagenesis/porosity model for an isolated carbonate platform during a sea level highstand (HST). Diagenesis and Porosity at the Parasequence Scale. Introduction. Cumulative diagenesis associated with parasequence stacking patterns in a 3rd order sequence. Diagenesis and Porosity at the Supersequence (2nd Order) Scale: Sequence Stacking Patterns. Introduction. Progradational sequence set and diagenesis. Aggradational sequence set diagenesis. Retrogradational sequence set and diagenesis. Diagenesis and Porosity at the 1st Order Scale: Icehouse Versus Greenhouse. Introduction. Long-term temporal changes in carbonate mineralogy: impact on diagenesis and porosity evolution. The architecture of sedimentary sequences and their diagenesis/porosity evolution as a function of long-term climatic cycles (icehouse versus greenhouse). Case Histories. Introduction. Controls over porosity evolution in Upper Paleozoic shelf limestones, Southwest Andrews area, Central Basin Platform of the Permian Basin, USA: porosity development as a function of subaerial exposure during an icehouse time. Stratigraphic controls over porosity development in an Albian ramp sequence, offshore Angola, Africa: porosity evolution under greenhouse conditions in a mixed siliciclastic/carbonate/evaporite setting. Summary. Chapter 9. Burial Diagenetic Environment. (Sample images from CD-ROM in pdf format: /inca/publications/misc/622101fig9-5.pdfFig.9-5 /inca/publications/misc/622101fig9-28.pdfFig.9-28 /inca/publications/misc/622101fig9-37.pdfFig.9-37) Introduction. The Burial Setting. Introduction. Pressure. Temperature. Deep burial pore fluids. Tectonic and basin hydrology. Passive Margin Burial Regiment. Introduction. Mechanical compaction and de-watering. Chemical compaction. Factors affecting the efficiency of chemical compaction. Subsurface cements in a passive margin setting. Petrography of burial cements. Impact of late subsurface cementation on reservoir porosity. Subsurface dissolution in a passive margin setting. The North Sea Ekofisk Field: a case history of porosity preservation in chalks. The Active or Collision Margin Burial Regiment. Introduction. Lower Ordovician Upper Knox Dolomite of the southern Appalachians, USA. Dolomitization in Devonian carbonates, Western Canada Sedimentary Basin, Alberta, Canada. The Post Tectonic Diagenetic Regimen. Introduction. Mississippian Madison Aquifer of the mid-continent, USA. Post orogenic aquifer system in Paleozoic carbonates of the Greater Permian Basin. Predicting Changes in Porosity with Depth. Summary. Chapter 10. Porosity Evolution from Sediment to Reservoir: Case Histories. (Sample images from CD-ROM in pdf format: /inca/publications/misc/622101fig10-9.pdfFig.10-9 /inca/publications/misc/622101fig10-26.pdfFig.10-26 /inca/publications/misc/622101fig10-34.pdfFig.10-34) Introduction. The Mississippian Madison at Madden Field Wind River Basin, Wyoming, USA. Introduction. General setting. Stratigraphic and depositional setting. Correlation of surface exposures into the deep subsurface at Madden. Burial history of the Madison. Porosity/permeability of Madison reservoirs and outcrop dolomites. Diagenetic history of the Madison, Wind River Basin. Conclusions and lessons learned from the Madison at Madden Field, Wyoming. The Upper Jurassic Smackover and Related Formation, Central U.S. Gulf Coast: A Mature Petroleum Fairway. Introduction. General setting. Sequence stratigraphic and depositional framework of the Upper Jurassic. Early diagenesis and porosity modification related to depositional sequences and sea level. Burial diagenesis and subsurface porosity evolution, Oxfordian reservoirs, central Gulf of Mexico. Upper Jurassic exploration and production constraints and strategies, central Gulf of Mexico. Conclusions and lessons learned from the Smackover of the central Gulf of Mexico. The Tertiary Malampaya and Camago Buildups, Offshore Palawan, Philippines: 3-D Reservoir Modeling. Introduction. Geologic setting. Lithofacies and depositional model. Diagenetic history. Reservoir rock types as model input parameters. The model. Conclusions and lessons learned from the 3-D modeling of the Tertiary Malampaya and Camago buildups. Epilogue. Introduction. The Legacy. The State of the Art. Where Do We Go From Here? References. Index. Dr. Clyde H. Moore received his BS degree in Geology from Louisiana State University, Baton Rouge and his MS and PhD degrees from the University of Texas in Austin. He spent a number of years as a research geologist with Shell Development Company in Houston, Texas and Ventura, California. During this period he studied Cretaceous carbonate sequences in Texas, modern clastic coastal depositional environments along the Atlantic coast, and Tertiary clastic sequences in the marginal basins of the Pacific coast. He joined the geology faculty at Louisiana State University in 1966 and retired as Professor Emeritus in 1997. During his tenure at LSU his research interests and the work of his students spanned all aspects of carbonate geology from modern sediments to ancients rock sequences around the world. His main focus in his later years at LSU was the nature and evolution of porosity in carbonate reservoirs. This research was sponsored by an industrial associates program. At present he is a research professor at the Colorado School of Mines in Golden, Colorado. He is an active consultant and teaches industrial seminars for Oil and Gas Consultants Inc (OGCI). His seminars include Carbonate Reservoirs and Sequence Stratigraphy. He was a Distinguished Lecturer for AAPG and recently received the AAPG Distinguished Educator award. He resides in Lakewood, Colorado.